Michael D. Jones, Lee S. Gill and Joseph D. Porter are pleased to announce that Jessica J. Crawford and Travis L. Crawford have been admitted as partners and that the name of the firm is changed to: JONES GILL PORTER CRAWFORD & CRAWFORD LLP. 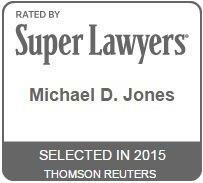 We are pleased to announce that Michael D. Jones has been selected to the 2015 Texas Super Lawyers list. This is an exclusive list, recognizing no more than five percent of attorneys in Texas. Michael Jones was invited to present a paper on Oil and Gas Lease Perpetuation at the Energy Bar Association, Mid-Year Conference at the Renaissance Hotel in Washington D.C. held on November 5, 2014.